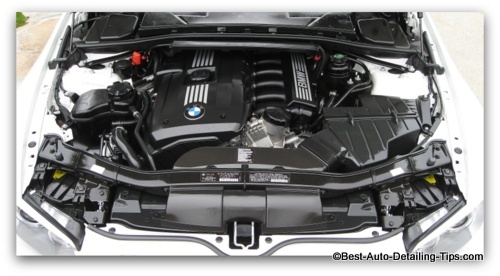 Car engine cleaning made simple and safe! The engines of today's modern cars are vastly different than the cars built 20+ years ago. From the many "how to clean a car engine" video's on Youtube, to the many posts made within car forums, it is an area that is often over-complicated with bad information from misinformed people to the point where most people are afraid to clean their cars engine due to hyped up concern and fear. While I have many customers in my professional world who never give their car engines a second thought, I personally think that detailing should extend to all areas of a car; including cleaning under the hood. 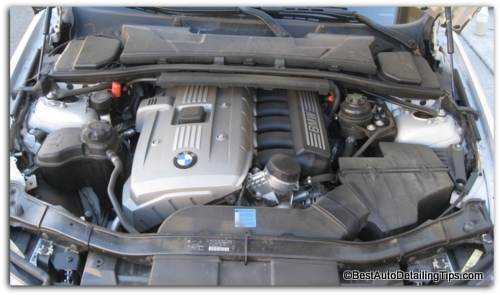 "Which of the car engines above would you rather see when opening the hood of your car? 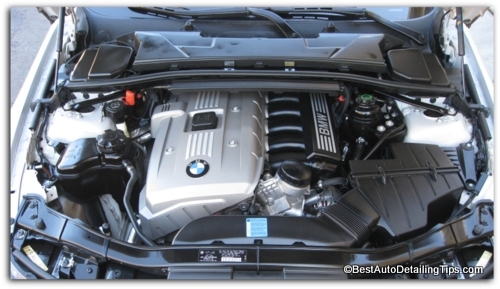 Which engine do you think would be treated with more respect from your auto mechanic?" This Super Degreaser put out by Meguiar's is one of my favorites and would hate to try and operate without it. Since it is professional grade product, you will not find this at your local retailer. And many of you might find it over-kill as far as purchasing an entire gallon if you are simply a driveway detailer. The good news is that this product is a concentrate and can be custom blended to suit your specific needs and can also be diluted to fit endless cleaning tasks.Just know that this is not the only degreaser that will work and you may want to see my best degreaser page for additional alternatives to the Meguiar's degreaser. "Cleaning and detailing your car engine to professional grade results requires both effective and safe products, combined with the right tools." Concentrate that can be custom blended for hundreds of uses. Does not leave white residue after drying; washes away clean. For engines I use a 4:1 dilution. Professional grade product; cannot be purchased at your local retailer. Match your spray bottle to the contents of that spray bottle. Has markings on bottle for traditional dilution ratios. If you're going to do it right, might as well really do it right with a dedicated labeled spray bottle. My first choice in sprayers. The most ergonomically friendly sprayer available. These are identical to the gray sprayers you might see in my pictures throughout this website. Darren's Note: Regardless of the sprayer head you choose and regardless of whether it is labeled as chemical resistant or not, you just never know how many sprays each head will deliver. For this reason I always keep extra sprayer heads on hand. Use these brushes to agitate heavily soiled areas of your car engine. Especially useful for degreasing and cleaning the under-side of your engine hood. You don't necessarily need to get both versions, but based on your car/truck and the reach you will need for car engine cleaning, you may need a longer reach brush to save your back. My professional choice in quality brushes. Feathered bristle tips for extra effectiveness and safety. "There are many people apposed to putting any kind of dressing on their car's engine in fear of attracting dirt/dust. Any dressing will not actually "attract" dust, but simply allow dust to attach to it easier. The real reason for the bad press is that now dust shows better on a freshly cleaned, detailed, and dressed engine just like dust shows better on a black car. I myself am a huge fan and consider a topping of dressing as a sacrificial layer between my engine components and incoming dirt that I can simply wash away easier next time around." I am a huge fan of aerosol dressings as they are both extremely convenient, they deliver a much finer mist than that of a traditional pull-trigger sprayer, and ideal for intricate areas such as a car engine. Product warning says "Flammable". You will not be spraying this to any open sparks or on a hot engine, and in 25+ years I have never had a problem. For use on both interior and exterior. Also an excellent engine dressing. Darren's Note: The simple and easiest approach to dressing your car engine after you are done with car engine cleaning is to use the aerosol dressing above. But to be more economical, you can get a liquid dressing (also good if you are off the main land and you can't have an aerosol can shipped by air) and use this professional grade product to achieve the same results. When using this dressing on an engine, I dilute down 1:3 (one part dressing and 3 parts water) as I want a thinner mix that will work better on all the intricate parts of your engine. When car engine cleaning, there will always be heated debate as to whether to apply some form of engine dressing to your car engine after you have degreased and cleaned it. Becomes a sacrificial layer that can easily be cleaned off each time you want to repeat car engine cleaning steps from above. I recommend either dressings above to take your freshly cleaned car engine to a level 10! Watch "how to video's" below for specific steps and tips.